The campaign is winding down folks, so it's time to bring out the proverbial big guns. In today's update, I'm going to be talking about a bunch of lore tidbits, a Campaign Almanac we'll be offering as an add-on, new BIG OL' stretch goals, and finally, a work-in-progress screenshot of an environment we're developing. As a quick reminder, we are getting close to 20,000 likes on [url="https://www.facebook.com/obsidian"]Obsidian's Facebook page[/url], which unlocks another level of the Mega Dungeon the Endless Paths – [url="https://www.facebook.com/obsidian"]if you get the chance, please head on over there[/url]. [b]Aedyr[/b] - People from the expansive Aedyr Empire and its former colonies, Dyrwood and Readceras. Aedyr literally translates as "Many Deer", but means "People of the Deer", referring to a 2,500 year-old tribe that became a kingdom 600 years ago. It merged with the elven kingdom of Kulklin in 2399 AI. Among the Aedyr, there is no significant cultural divide between humans and elves. Because of their close contact and integration in spite of physiological differences (such as longer elven lifespans), their culture and legal system have developed a variety of unique concepts such as the [i]haemneg[/i], or ceremonial marriage. Ethnic Aedyr (mostly humans and elves) have fair skin and a variety of hair and eye colors, with blue and green being common. Among other cultures, Aedyr clothing is known for being relatively simple in construction and often using large, colorful striped or checkered patterns for accents. [b]Anni Iroccio[/b] - Year of Iroccio. This is the commonly-used calendar in and around the Dyrwood. It is only 150 years old and Vailian in origin, but has been adopted by the residents of Dyrwood and much of the surrounding area due to the hopeless inaccuracy of the Aedyre calendar. Though the Iroccian calendar replaced earlier Vailian calendars, the inventor, Iroccio, started from the same time as his predecessors. It is currently 2823 AI. [b]biamhac[/b] - The most feared phenomenon of Eír Glanfath, biamhacs are "spirit winds" that rise up in cursed ruins, shearing souls away from the bodies of their owners. They appear suddenly and without warning, leaving victims little hope of escape. Strong-souled people are not harmed by biamhacs, but affected individuals are instantly reduced to a catatonic state. The discovery of numerous biamhacs in Eír Glanfath during its early exploration resulted in thousands of Aedyr deaths. [b]Dyrwood[/b] - Strictly speaking, the forest northwest of the Bael River. [b]Dyrwood, Free Palatinate of[/b] - The independent nation that was formerly a colony and later a large, remote duchy of the Aedyr Empire. Led by their duke, Admeth Hadret, the people successfully fought for their independence over an excessively burdensome campaign to colonize the dangerous ruins of Eír Glanfath. Despite the fact that they are no longer, properly speaking, a palatinate (nor a duchy), the people of Dyrwood continue to refer to their home as a "Free Palatinate" out of pride. Most residents of the Dyrwood are Aedyr humans, elves, and dwarves, but many are also culturally integrated orlans or children of Glanfathan elves. Despite having fought a war with the Aedyr Empire in the past, they are now trading partners and have maintained few grudges. Their one continued point of contention is exploration and colonization of Eír Glanfath, which Aedyr continues to push through official and unofficial means. [b]Eír Glanfath[/b] - The name natives give to an indeterminately old elven kingdom that covered the entire forest southeast of the Bael River. Though they were not technologically advanced compared to contemporary civilizations, they had accomplished a number of architectural and astronomical feats that explorers and scholars are still trying to understand. Whatever the extent of Eír Glanfath's kingdom was, its ruins had been abandoned for centuries, possibly even millennia, before Vailians or Aedyr arrived in the area. The so-called "Glanfathan" elves in the forest seemed to have no cultural connection to the kingdom and were living in nomadic communities instead of the old structures. Eír Glanfath's ruins are not understood by anyone, and early misinterpretations over their significance resulted in two small-scale conflicts: The Broken Stone War and The War of Black Trees, the latter of which ended with a fire that consumed a vast section of the Dyrwood. [b]Eothas[/b] - The Aedyran name for a god of light and redemption. While worship of Eothas is still popular in the Aedyr Empire and Readceras, the faith is outlawed in most cities of the Dyrwood due to events of the Saint's War that culminated at Godhammer Citadel. Though Eothas once communicated regularly with his faithful, he has not done so since the destruction of St. Waidwen at the Battle of Godhammer over 200 years ago. [b]Hylspeak[/b] - An old dialect of Aedyran only spoken by rural communities and older elves in the Aedyre heartlands. It is grammatically almost identical to Aedyran, but contains a large number of archaic words that have either disappeared from contemporary use or taken new forms over time. Speakers of contemporary Aedyran can understand Hylspeak, but it can sometimes be confusing. Hylspeak is only commonly heard in folk songs and poems that have survived over the centuries. Some people associate the spontaneous speaking of Hylspeak with an awakened soul. As a result, superstitious folk are easily angered when they hear it spoken, believing it may cause their soul to remember a past life. [b]Magran[/b] - The Aedyran name for a goddess of war and fire. Her priests commonly employ firearms and some helped construct the "Godhammer" bomb used to destroy St. Waidwen. Following the Saint's War, she became the most popular faith in Dyrwood. In Aedyr, her symbol is a flame, but in Dyrwood, it is a flaming bomb. Worship of Magran is extensively persecuted in Readceras. [b]orlan[/b] - A race of people found mostly in northern, temperate climates but also as far south as the Dyrwood. Physically, they are notable for their small stature, two-toned skin, and exceptionally large, hair-covered ears. Due to their size, orlans have been victimized and marginalized by most of the cultures with whom they have come into contact. As a result, it is rare to find large communities of them and they have progressively retreated into heavily wooded environments over the last few centuries. Many orlan communities have also adopted brutal guerilla tactics including heavy use of traps and poison in the surrounding environment. As a result, even orlans raised in urban cultures often share their rural kin's nasty reputation. [b]Readceras, The Penitential Regency of[/b] - The ecclesiastic nation that was formerly an Aedyre colony and later an independent theocratic dictatorship (the Divine Kingdom of Readceras). Two centuries ago, a popular religious movement took hold in the countryside, in part sparked by the collapse of the nation's [i]vorlas[/i] (purple dye-producing plant) market, its resultant poverty, and general civil unrest. The leader of the movement was a farmer named Waidwen who claimed that the Aedyre god of light, Eothas, had appeared to him in the night and told him to punish the colonial governor for leading the people to ruin. Waidwen's success led to his apparent transformation into a living vessel for Eothas, after which he became the first and only "divine king" of the country. His rule produced a subsequent purge of heretics and followers of other faiths across the nation. Events related to this purge led to the Saint's War with Dyrwood, which informally ended in 2618 AI when Waidwen was apparently destroyed by a massive bomb north of Halgot Citadel (popularly renamed Godhammer Citadel). [b]svef[/b] - Svef is the Aedyran name for a potent narcotic produced from the berries of small shrub that grows in the dry, distant mountains of Tal Kness. Svef produces hallucinations and, according to some, allows users to actually see their own soul. The narcotic was introduced to the Aedyr long ago, but it is used more frequently in the Dyrwood due to its heavy trafficking by Vailian merchants. [b]Vailians[/b] - Most Vailians come from the Vailian Republics, a federation of independent city-states made up of former colonies from the Grand Empire of Vailia. They are a powerful mercantile force in the southern hemisphere, trading with more partners than any other nation or empire. Five cities are considered "grand" republics and have greater voting power in their electoral council: Spirento, Ancenze, Selona, Ozia, and Revua. The federation is widely known for its access to most major commodities in the world, including slaves, and for its habit of impressing (abducting) foreigners into service on their naval vessels. Ethnic Vailians (humans and a small number of dwarves) have dark brown skin and tightly spiraled, dark brown hair. They most commonly have brown or black eyes, but occasionally have green, hazel, or grey eyes. Vailians pride themselves on their well-made and intricately-decorated clothing, often made with rare materials and dyes to which they have easy access. At $2.0 Million, your support funded a player house. Inspired by features like The Sink found in [i]Fallout: New Vegas Old World Blues[/i], the house is a convenient place to store gear, interact with companions, craft items (thanks to the $2.4 Million stretch goal), rest, and buy and sell from special merchants. Some of you wanted something that went beyond the standard player house, allowing you to take control of a full stronghold and its surrounding lands. 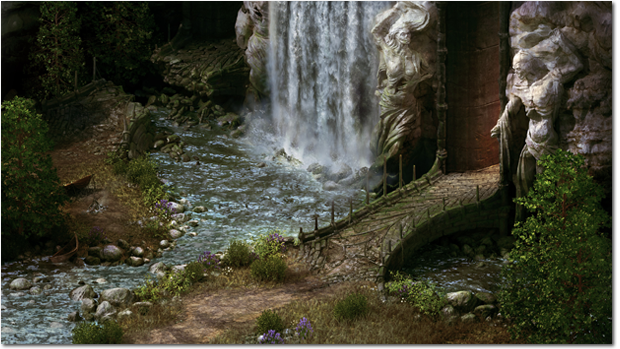 Well-done strongholds provide players with the ability to make large scale changes, undertake special quests, customize the contents of the stronghold and the surrounding environment, and engage in light strategic gameplay between adventures. If we hit $3.0 Million, we will build a stronghold worthy of the title! 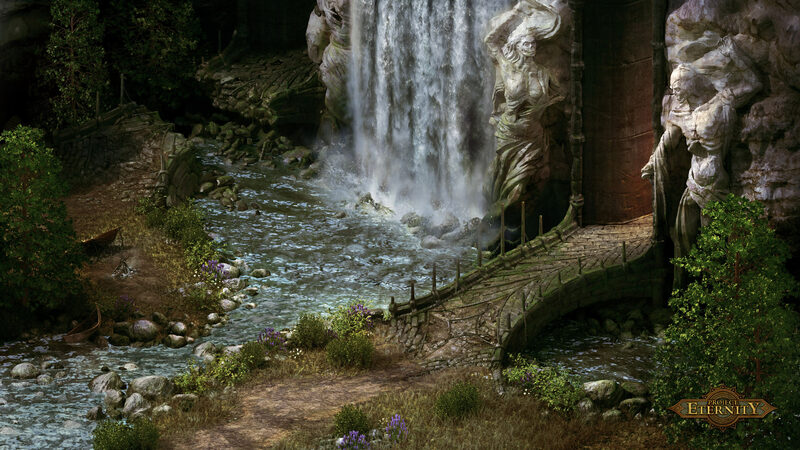 Baldur's Gate and Athkatla are [i]big cities[/i]. Spanning multiple large maps with a ton of interiors, characters and quests, big cities are a lot of fun. Like strongholds, they also take a lot of work to do well. We're going to have one big city in Project Eternity. Would you like two? If you take us on an exciting adventure to $3.5 Million, we will take you on an exciting adventure to another big city. $4million+ raised, I think our jobs here are done. [size=3][b]Campaign Almanac [/b][/size]Looks like a good compromise for people wanting to play their own PnP of the world? My friends will love that. Need a companion? Or a cube? Join the Order now! I recall there were some pre-rendred backdrop scene in Final Fantasy 7 with animated waterfall. If they can achieve that, I think it should be a no big deal today. The picture touches my special place. That screenshot is just...wow. Just wow. Am I allowed to scoff at the pinheads who made a fuss about the choice of engine now?